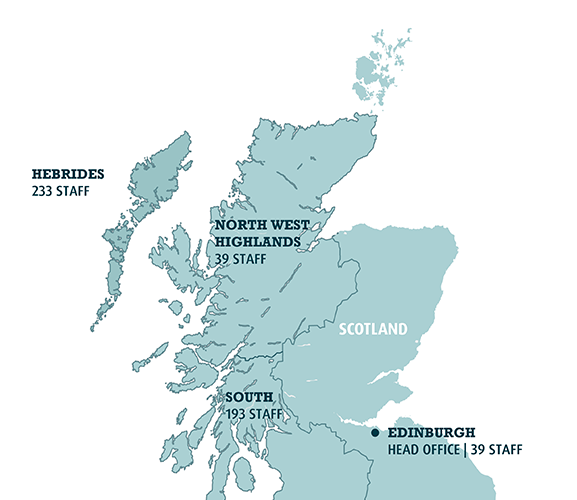 95% of our staff live in rural Scotland close to where we raise and process our salmon. Our main centres of farming and processing are around Loch Fyne in Argyll, the North-West Highlands, around Loch Carron and Loch Torridon, and on the Hebridean Islands of Lewis, Harris, Uist and the Isle of Skye. We also farm on the Isles of Arran, Gigha, Mull and Benbecula with our Head Office in Edinburgh, Scotland’s ancient capital city.